An Expression of Interest (EOI) is used to gauge interest from potential suppliers for a project you have on the drawing board or hope to tender in the near future. By issuing an EOI, you are given the opportunity to pre-qualify vendors capable of completing the work under the restrictions or specifications outlined in your proposal. Is an EOI similar to or the same as a RFP (Request for Proposal), RFI (Request for Information)? Basically, yes they can be construed as being the same, with the exception of the potential legal ramifications so seek counsel or legal advice to ensure you understand how issuing any of the above will impact your company in the country, state or province you operate your business in. A poorly worded RFQ or RFP may imply you are making a purchase which can be challenged as an implied contract so again review with legal before issuing proposals. RFQ65 – Expression of Interest is an eight (8) page sample template which can be used for solicitation of interested parties capable of providing an assets disposal service. Keep in mind you can tailor most of our templates to suit your own requirements. Many purchasing professionals will develop a Technical Compliance Matrix to display and evaluate vendor responses from their EOI. 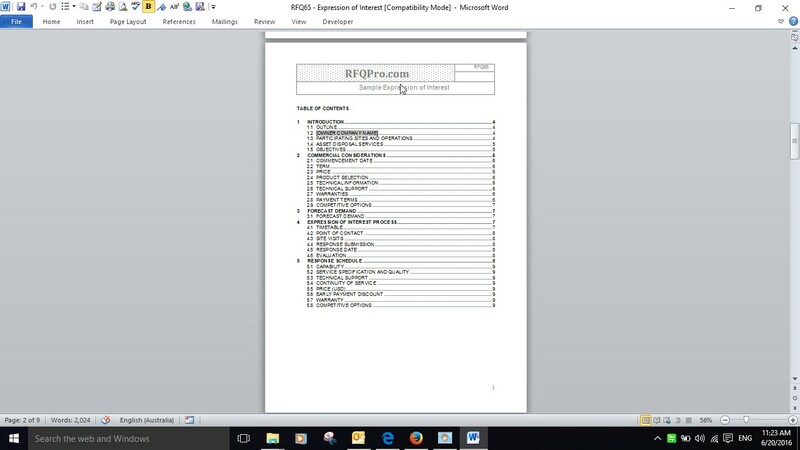 RFQ66 – Technical Compliance Matrix is used in conjunction with RFQ65. Why write an expression of interest when you can download a sample template here? Here is a preview of the table of contents in our Expression of Interest which is available in both our Premium and Mega pack.